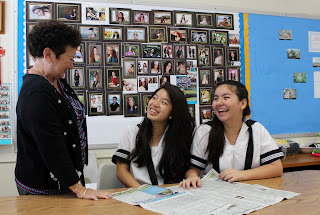 Taryn Wong and Ellie Ramirez are all smiles to their Economics teacher, Lurline Choy, upon being notified that their team placed first in the Growth Division of the Spring Hawaii Stock Market Simulation Competition. Teams of 2 to 4 students invested a hypothetical $100,000 in stocks, bonds and mutual funds over a 10 week period. Sacred Hearts Academy​ entered 16 teams with eight teams continually in the top 10 slot. The Simulation is sponsored by the Hawaii Council on Economic Education​.